A team of researchers from several institutions in Japan and one in the U.S. has identified a fossilized bone, long believed to be from a dinosaur, as belonging to a Paleoparadoxia. In their paper published in the journal Royal Society Open Science, the group describes the history of the bone and how it was finally correctly identified. The researchers report that the bone was found sometime during the 1950s when workers building a dam came across it. The bone was found near the town of Tsuchiyu Onsen in Fukushima. Archeologists called to recover the fossil described it in a note as a dinosaur femur, and later placed it on a shelf in a museum. It was there on that shelf that the researchers with this new effort found the bone. Testing showed the fossil was from approximately 15.9 million years ago (long past the age of the dinosaurs) and that it was actually the fossilized remains of a Paleoparadoxia femur. Paleoparadoxia resembled the modern hippopotamus—prior research has shown that they were plant eaters and grew to approximately two meters in length. They lived in what is now the Pacific Ocean from 20 to 10 million years ago, with a range running from Alaska to Japan and as far south as Mexico. They were also once thought to be amphibious, but more recent research has shown that they were true marine animals, spending most of their time crawling around on the ocean floor eating. The researchers report their work was made easier by the hand-written note left by the original investigators along with the fossil describing where it had been found. That allowed the researchers to return to the dig site to further investigate its history and to provide material for dating the fossil. Instead of testing the thigh bone directly, the team tested rock from the dig site, which contained datable crystal zircons. 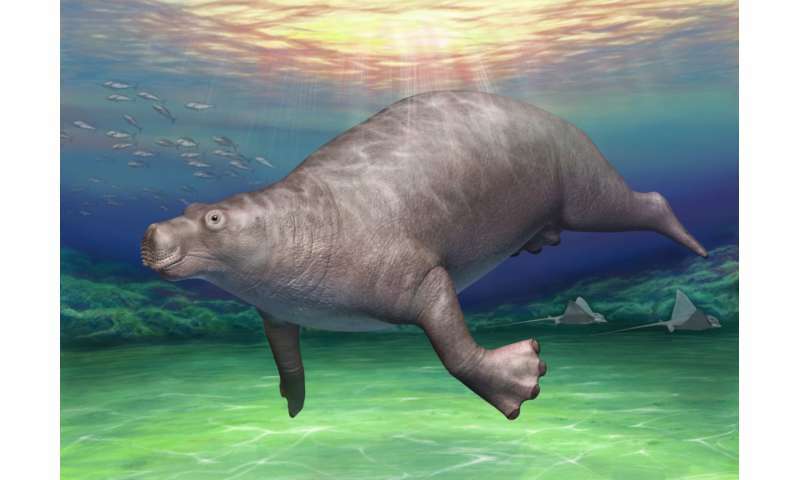 After measuring the fossil, the researchers used it to create a 3-D model of the creature when it was alive. They report that due to the condition of the fossil, the recreation was believed to be the most accurate to date. Here, we report a new 'discovery' of a desmostylian fossil in the geological collection at a national university in Japan. This fossil was unearthed over 60 years ago and donated to the university. Owing to the original hand-written note kept with the fossil in combination with interview investigation, we were able to reach two equally possible fossil sites in the town of Tsuchiyu Onsen, Fukushima. Through the interviews, we learned that the fossil was discovered during construction of a debris flow barrier and that it was recognized as a 'dinosaur' bone among the locals and displayed in the Village Hall before/until the town experienced a fire disaster in 1954. As scientific findings, the fossil was identified to be a right femur of Paleoparadoxia (Desmostylia), which shows well-preserved muscle scars on the surface. The age was estimated to be 15.9 Ma or younger in zircon-dating. This study shows an excellent case that historical and scientific significances could be extracted from long-forgotten uncatalogued specimens as long as the original information is retained with the specimens.